Skin Designer 3D for Minecraft by Eighth Day Software, L.L.C. Easily convert your skins between 3-pixel arm skins and 4-pixel arm skins. Now, with the press of a button, you can quickly convert your 4-pixel arm skins to 3-pixel arm skins. 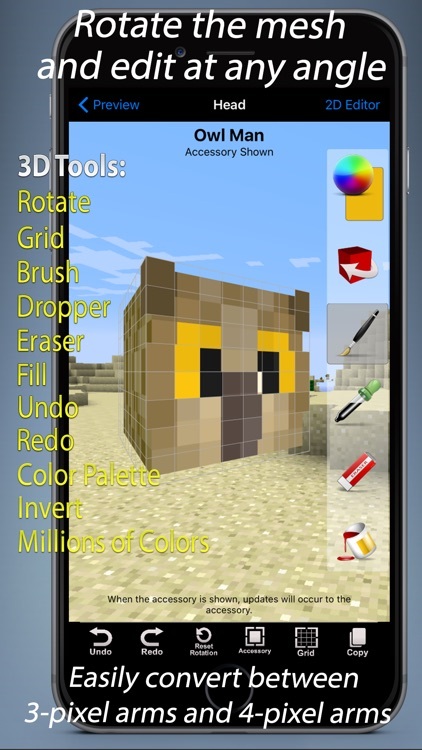 To update your skins in Minecraft PE, simply export your skin to the photo album and import it directly into Minecraft PE. We've provide a convenient option to perform this task. Generate your skins automatically, pulling from our database of over 200,000 skins. Just press the "Generate Skin" button and automatically pull down a new skin. 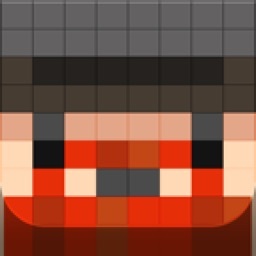 Add it to your library or generate another skin until you have found one you like. We are continually adding new skins to our collection. An internet connection required for this feature. 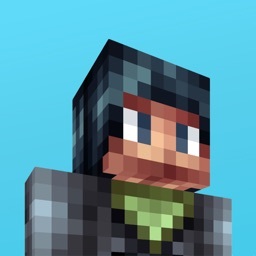 * Supports the new Minecraft skin format. 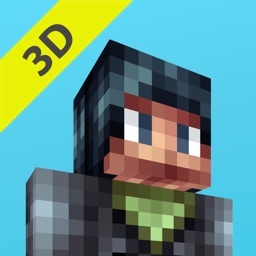 * Support for Minecraft PC, Mac, and PE. * Support for 3-pixel arms and 4-pixel arms. * Unlimited number of save slots to manage your skins. * Full 3D editing from any angle for the head, body, left arm, right arm, left leg, right leg, as well as all the skin accessories (hat, jacket, sleeves, pants). Since you are updating the skin in 3D, you'll see the results as you make changes. * Position the character parts (head, body, left arm, right arm, left leg, right leg) at any angle and make modifications in place. * Modify the skin accessories in 3D while positioned over the corresponding part, allowing you to see it's effect instantly. * Optionally edit the skin and accessories in 2D if desired. * Modify the left and right arm independently. * Modify the left and right leg independently. * Copy between the left and right arms/legs (mirror image or exact copy). * Copy skin parts from one skin to another skin (complete flexibility). * Invert vertically or horizontally, any side of any skin part. * Modify accessories independently (head, body, left arm, right arm, left leg, right leg). * Modify all the skin parts in 2D or 3D (including accessories). * When viewing or editing in 3D, show or hide each accessory independently. * Create skins from scratch or start with one of over 2000 included templates. 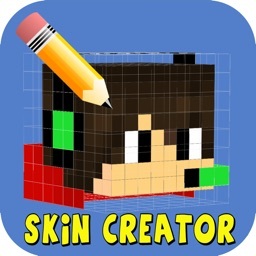 * Copy a skin and make modifications without affecting the original skin. 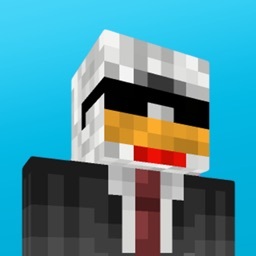 * Use the "Skin Stealer" option to download skins of other users from Minecraft.net. 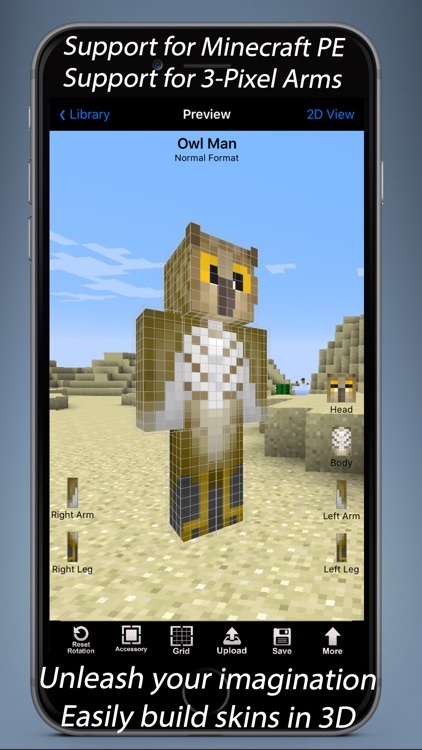 * Upload skins to minecraft.net from within the app for use on Minecraft PC/Mac or export it to your photo album for use with Minecraft PE. * Choose a background that looks similar to game play or choose a background that is a solid color (standard black, standard white, or choose a custom color). * Import skins from your photo album in either the legacy format of 64x32 or the new format of 64x64. 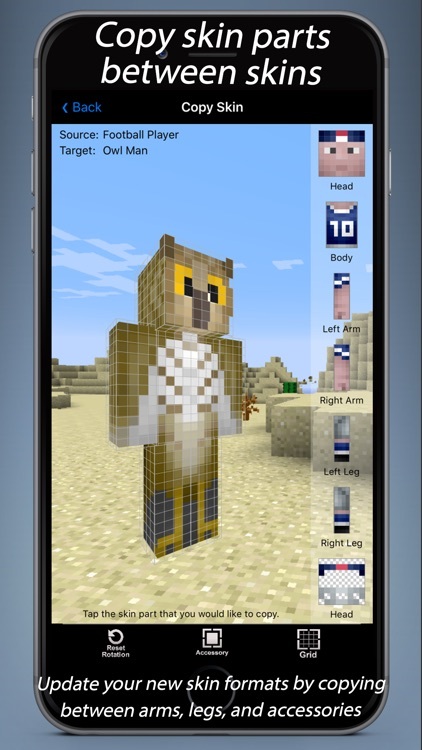 * Export a skin formatted to be used on Minecraft.net or export your skin as a 3D image from the angle you choose. * Share your skin on your Facebook or Twitter account from within the app. * Email your skin to yourself and/or friends. 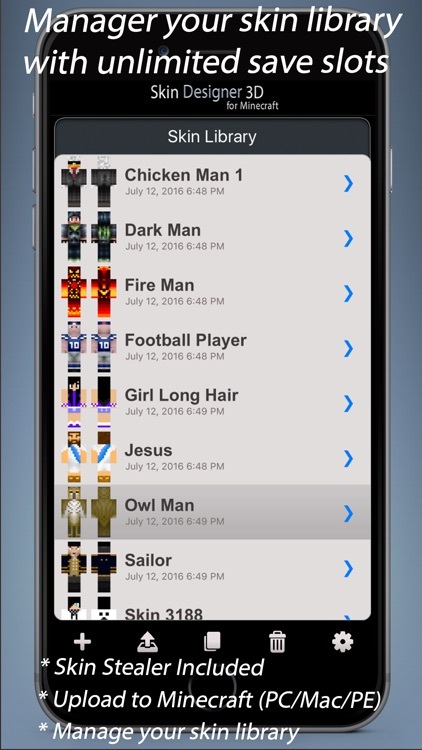 Note: The skins produced from this app ONLY work on Minecraft PC/Mac/PE. These skins are NOT compatible with Minecraft XBox. 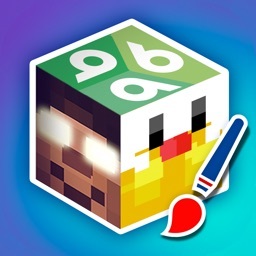 This app is not made by, nor affiliated with the owners of Minecraft. 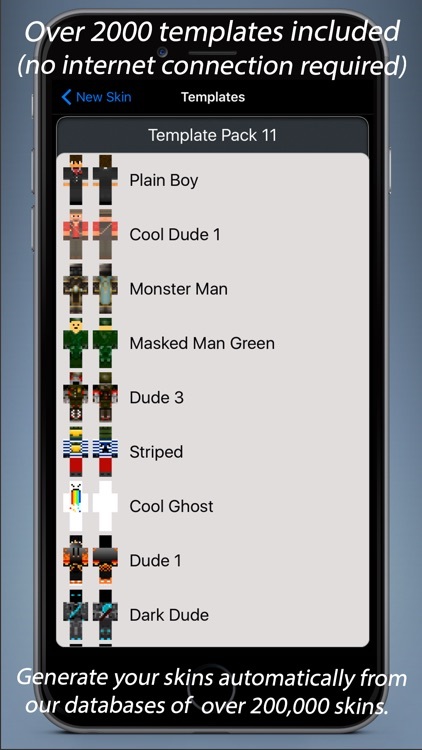 This app is NOT the game of Minecraft, but rather a tool to help you manage and customize your characters in the game.